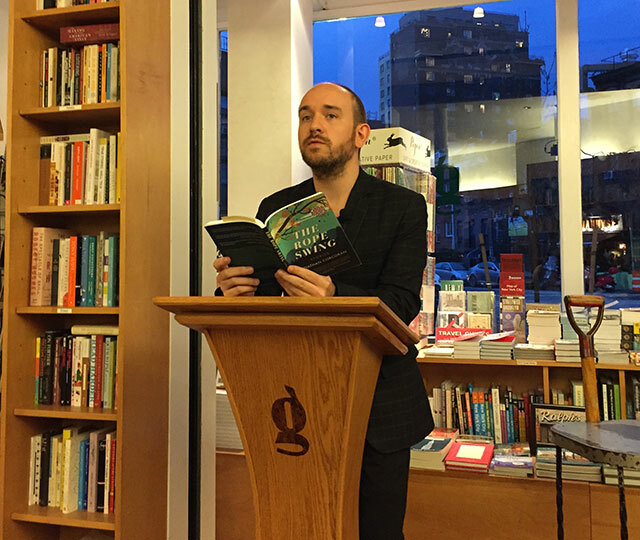 Jonathan Corcoran launched his debut collection of short stories, The Rope Swing, earlier this month at AWP. 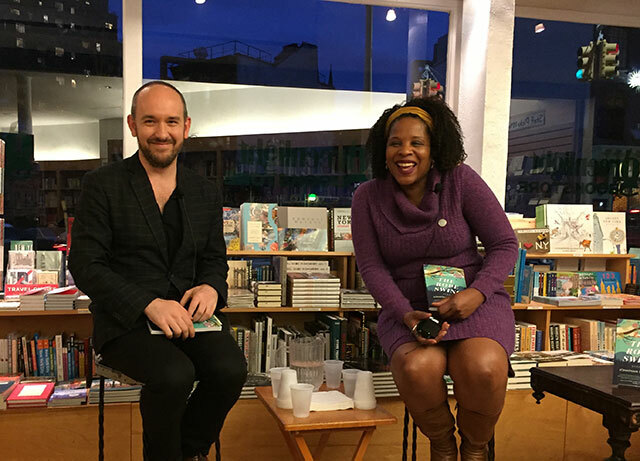 He was joined by Tayari Jones at Greenlight Bookstore in Brooklyn to discuss the story collection. Corcoran studied under Jones at Rutgers Unviersity-Newark where he attended the Creative Writing MFA program and where Jones is a professor. The book was published by West Virginia University Press. The Rope Swing is a collection of stories focusing on the lives of numerous characters in a small West Virginia town deep in the heart of Appalachia. Corcoran draws on his own experiences growing up in this remote part of the world. Many of the narratives, though not all, deal with the LBGTQ experience in such a place. The collection confronts the broader ideas of looking outward from isolated places. “A book is built on many shoulders,” Corcoran says. Corcoran read from the title story in the collection, the first story in the collection that serves partly as a way of introducing the setting. The story is written in the plural first person, furthering the idea that the collection is about the people of the town. “To me it’s a book about people on the cusp,” Corcoran says. The title signifies the choice people face. A rope swing is just an object, to swing from the swing into the river requires choosing to climb onto it. Some characters make that choice, others never do. Even those who choose to swing face challenges because swinging doesn’t assure any specific outcome. It’s possible to swing into the river, but also possible to fall into rocks. “Some states have a rep,” Jones says, adding that West Virginia is a place that means something. People recognize it as a signifier of a specific idea of isolation and rural living. “Southern writers have an outsized sense of place,” Corcoran says. West Virginia is entirely in Appalachia, in the mountains, he explains. Mountains do something to your mind. They are protective but they also close out the world. “It’s not a monolithic place,” he says. There is a huge variety of people and ideas and he wanted to imagine what it was like for those people to look out into the world beyond the mountains. Jones says that when a writer writes a memoir, everyone wants to find the lie, and when writers write fiction, everyone wants to catch the truth. She asks Corcoran how much of the collection is fiction and how much of it is real. Corcoran says that in all his fiction he draws on his own life experiences. It is essential to writing to have a basis in reality but that doesn’t make a work memoir. He was a gay man in West Virginia, he says, but it also wasn’t all bad. At the age of twenty, he wasn’t out to to anyone in West Virginia. He was in college and in love with a man. He wrote a letter, but never sent it. His mother ended up finding the letter in his things–that’s how his mother found out. He eventually went on to marry the man. Another interest he had was writing about West Virginia in the pre-internet era when it felt especially remote. How do you learn how to be a gay man without the internet in a place like that, he says. The world is changing, but the mountains slow down that change. “This is the book I knew I had to write,” he says. Writing the book left Corcoran feeling like he was screaming all the time. To write the book meant mostly him alone in a room for years, and then the stories came out in fits. Corcoran says he has since started working on a novel.